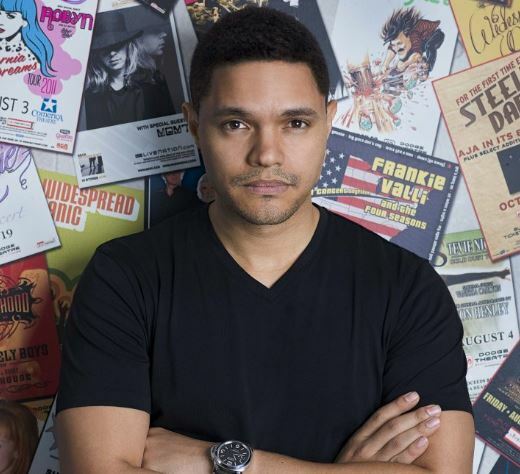 Comedian and author Trevor Noah, host of the Emmy- and Peabody Award-winning “The Daily Show” on Comedy Central, will visit Syracuse University in late January 2019 as a special guest of the Dr. Martin Luther King Jr. Celebration, in collaboration with the University Lectures series. Syracuse University’s 34th annual MLK Celebration—the largest event of its kind in the country—will take place on Sunday, Jan. 27, in the Carrier Dome. Noah will take part in an on-stage conversation, talking about his acclaimed memoir, “Born a Crime: Stories from a South African Childhood” (Random House, 2016), reflecting on the life and legacy of Dr. King, and discussing the global impact of the civil rights movement. Further details of the event will be announced later in the fall. “Born a Crime” is the selected book for the 2018-19 Syracuse Reads Program, a shared reading initiative coordinated by the Provost’s Office that is part of the First-Year Experience for all new SU students. The initiative aims to engage students in a shared experience that explores themes of identity, belonging, diversity, inclusion, and health and wellness. In the book, Noah, who was born in South Africa to a black South African mother and a white European father, recounts his childhood growing up during the last days of apartheid and the opportunities and adventures with his mother in the period that followed. The University provided more than 3,900 special softcover copies and e-copies of the book to all incoming first-year and transfer students in June. The students were instructed to read “Born a Crime” over the summer. After their arrival on campus for the fall semester, the students will participate in a series of five-week discussion sessions—co-led by a student peer facilitator and a faculty, staff or graduate student lead facilitator—intended to enhance the students’ understanding of the topics addressed in the book and engage them in broader contexts about identity, resiliency, inclusion and community. Free copies of “Born a Crime” have also been made available through the SU Bookstore to current students, faculty and staff with a valid SUID, and individuals have been encouraged to host their own discussions or book club readings about the book. Noah is the most successful comedian in Africa. He joined “The Daily Show with Jon Stewart” in 2014 as a contributor and took over as host of the show in September 2015, upon Stewart’s retirement. He was named one of “The 35 Most Powerful People in New York Media” by The Hollywood Reporter in 2017 and 2018, and Time magazine named him to its Time 100, an annual list of the 100 most influential people in the world,” for 2018. Born in Johannesburg in 1984, Noah began his career as a comedian, presenter and actor in his native South Africa in 2002. He held several television hosting roles with the South African Broadcasting Corp. and performed in stand-up comedy tours across South Africa. He was creator and host of “Tonight with Trevor Noah” from 2010 until 2011, when he relocated to the United States. Noah was the subject of the award-winning 2012 documentary “You Laugh But It’s True,” which tells the story of his remarkable career in post-apartheid South Africa. That same year, he starred in the one-man comedy show “Trevor Noah: The Racist,” which was based on his similarly titled South African special, “That’s Racist.” His Showtime comedy special “Trevor Noah: African American” premiered in 2013. He recorded the stand-up special “Trevor Noah: Lost in Translation” for Comedy Central in 2015 and debuted his ninth comedy special, “Trevor Noah: Afraid of the Dark,” on Netflix in 2017. In his time as host of “The Daily Show,” both he and the program have won numerous honors, including a Writers Guild of America Award, a Nickelodeon Kids’ Choice Award, a GLAAD Media Award, an MTV Movie & TV Award and a Primetime Emmy Award, all in 2017. “The Daily Show” has been nominated for several awards in 2018, including three Primetime Emmys: for Outstanding Variety Talk Series, Outstanding Interactive Program and Outstanding Short Form Variety Series; the 70th Primetime Emmy Awards will be broadcast on NBC on Sept. 17. In 2016, Noah released “Born a Crime,” his first book, which was an immediate New York Times bestseller. Additionally, his performance on the “Born a Crime” audiobook was Audible’s highest rated audiobook of 2016, and it has remained one of the top selling titles on Audible since its release. It was also nominated for two NAACP Image Awards, one for Outstanding Literary Work by a Debut Author and another for Outstanding Literary Work in the Biography/Auto-Biography category. The book is a collection of personal stories about growing up in South Africa during the last gasps of apartheid and the tumultuous days of freedom that came with its demise. Already known for his incisive social and political commentary, Noah with the book turns his focus inward, giving readers an intimate look at the world that shaped him. He shares true stories, sometimes dark, occasionally bizarre, frequently tender, and often hilarious: from subsisting on caterpillars during months of extreme poverty to making comically hapless attempts at teenage romance to the occasion he was thrown in jail to the time he was tossed from a speeding car driven by murderous gangsters. For the 2018-19 academic year, the First-Year Experience is focused on three core areas: anchor courses within each school or college; a shared reading and discussion experience with peers, faculty and staff; and health and wellness activities. These three areas aim to build community, improve cross-cultural skills and increase practices of healthy habits for first-year and transfer students. With the selection of Trevor Noah’s memoir, “Born a Crime,” the shared reading is meant for new students—and the entire University community—to engage in a common experience and explore themes of identity, belonging, wellness, diversity and inclusion. Syracuse University’s celebration of Dr. Martin Luther King Jr. is the largest event of its kind on a college campus. The 34thannual event will take place on Sunday, Jan. 27, in the Carrier Dome. The event got its start before Congress acted to recognize Dr. King with a federal holiday honoring his memory and accomplishments. Syracuse University’s celebration includes student and community entertainment, dinner and presentation of the Unsung Hero Awards, which recognize local community members who have championed the plight of those in need. The University Lectures is Syracuse University’s premier speaker series, with a long and distinguished history of showcasing individuals of exceptional accomplishment who share their talents, experiences and perspectives for the enjoyment of SU students/faculty/staff and the Central New York community. Now entering its 18th year, the cross-disciplinary series was created through, and is supported by, the generosity of alumnus Robert B. Menschel ’51.